The other day something led me to re-read some of the articles and commentaries Sri Aurobindo wrote during his 'active' political revolutionary days, when he was writing and editing the nationalist journal Bande Mataram during 1906-1908. For me it was a wonderful exercise to reflect upon the fact that some of the ideals, ideas and thoughts he was presenting more than a century ago are still highly relevant and perfectly applicable. Of course, the arguments and examples he was giving at that time were particular to the political and nationalist struggles of the time, India's freedom movement, to be more specific. But the fact that the fundamental principles and ideals he was speaking of remain perfectly applicable even today, despite the very different political context and circumstances, says something about the deeper truth value of these principles, and the timelessness of the Source from which such fundamental principles emerge. Even for the political arena. I present just one example here. This is from his writing titled "The Morality of Boycott". I am sharing only a few excerpts here, with the hope that readers, particularly Indian readers, will be able to see how relevant these principles are in today's political context of the nation. A certain class of minds shrink from aggressiveness as if it were a sin. Their temperament forbids them to feel the delight of battle and they look on what they cannot understand as something monstrous and sinful. “Heal hate by love, drive out injustice by justice, slay sin by righteousness” is their cry. Love is a sacred name, but it is easier to speak of love than to love. The love which drives out hate, is a divine quality of which only one man in a thousand is capable. A saint full of love for all mankind possesses it, a philanthropist consumed with the desire to heal the miseries of the race possesses it, but the mass of mankind do not and cannot rise to that height. Politics is concerned with masses of mankind and not with individuals. To ask masses of mankind to act as saints, to rise to the height of divine love and practise it in relation to their adversaries or oppressors, is to ignore human nature. It is to set a premium on injustice and violence by paralysing the hand of the deliverer when raised to strike. The Gita is the best answer to those who shrink from battle as a sin and aggression as a lowering of morality. Hinduism recognizes human nature...It sets one ideal for the saint, another for the man of action, a third for the trader, a fourth for the serf. To prescribe the same ideal for all is to bring about varnasankara, the confusion of duties, and destroy society and the race. 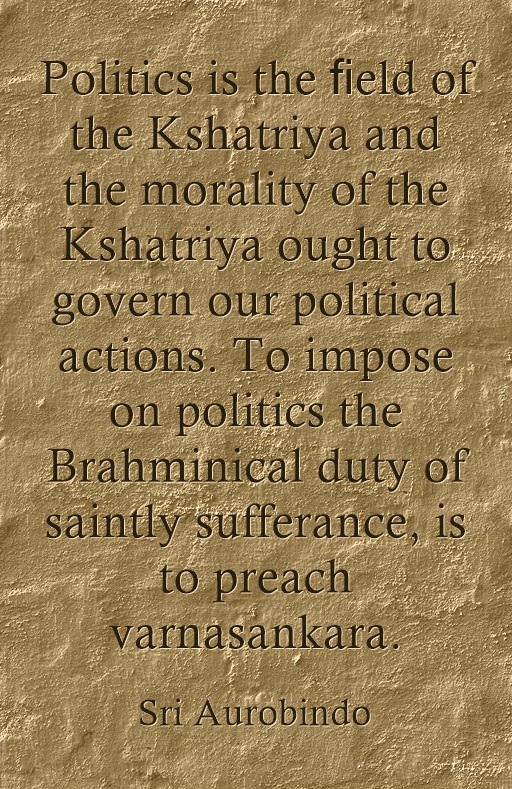 Politics is the ﬁeld of the Kshatriya and the morality of the Kshatriya ought to govern our political actions. 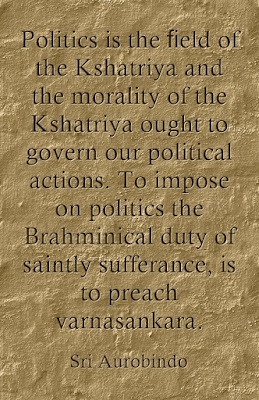 To impose on politics the Brahminical duty of saintly sufferance, is to preach varnasankara. Justice and righteousness are the atmosphere of political morality, but the justice and righteousness of the ﬁghter, not of the priest. Aggression is unjust only when unprovoked, violence unrighteous when used wantonly or for unrighteous ends. It is a barren philosophy which applies a mechanical rule to all actions, or takes a word and tries to ﬁt all human life into it. The sword of the warrior is as necessary to the fulﬁlment of justice and righteousness as the holiness of the saint. Ramdas is not complete without Shivaji. To maintain justice and prevent the strong from despoiling and the weak from being oppressed is the function for which the Kshatriya was created. To read the previous post in the series, click here. To read all posts in the series, click here.